Performs well in low profile clearance doorways. Stain & Mildew resistant Olefin yarn. Durable anti-static Olefin surface floor mats with excellent water retention and exceptional quick-drying capabilities are ideally suited for indoor and outdoor use. Resilient against salt and ice melt, the low	profile tufted cut-pile Decalon® removes and traps dirt so as not to spread onto carpets and floors. 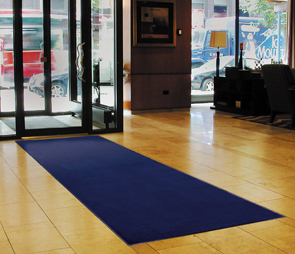 Sabre™ is a step above the commodity entrance floor mat and is intended for all medium traffic areas including entrances and lobbies. Variety of colors available to complement any surroundings.